We are hosting an Easter brunch this year that includes family and friends who celebrate both Easter and Passover. How do we do this gracefully and keep everyone happy? Help! Your willingness to open your home to family and friends celebrating both holidays is testament to your kind heart. 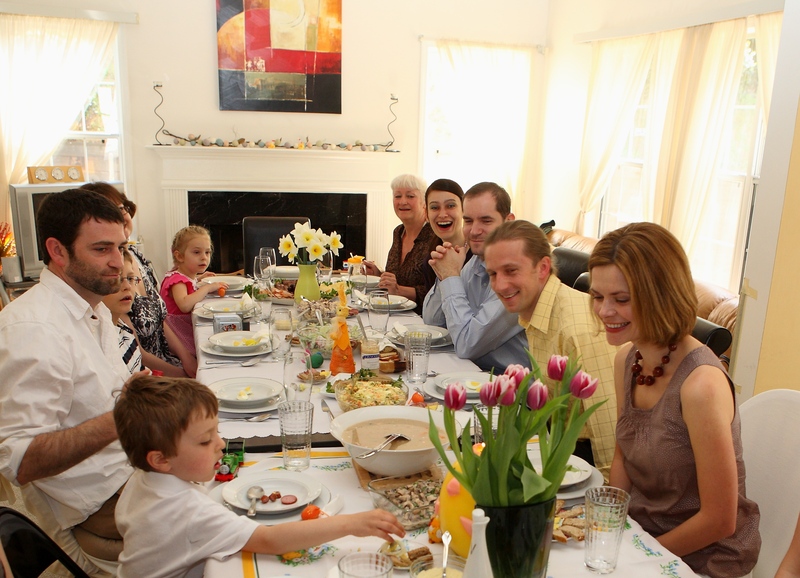 Easter and Passover holidays are a traditional time for family and friends to gather, share stories, and enjoy a special time together. Yes, it is possible to host these holidays simultaneously. Oxford English Dictionary defines Easter as the most important and oldest festival of the Christian Church, celebrating the resurrection of Jesus Christ and held (in the Western Church) between March 21 and April 25, on the first Sunday after the first full moon following the northern spring equinox. According to Bede, the word is derived from Ēastre, the name of a goddess associated with spring. According to the Oxford English Dictionary, Passover is defined as the major Jewish spring festival which commemorates the liberation of the Israelites from slavery, lasting seven or eight days from the 15th day of Nisan. The origin of pass over is to 'pass without touching', a reference to the exemption of the Israelites from the death of their firstborn. Celebrating both holidays at the same time can be accomplished with knowledge of what is required in a kosher kitchen. The culture key is to keep it kosher. Kosher describes food (or the premises in which food is sold, cooked, or eaten) that satisfies the requirements of Jewish law. Restrictions on the foods suitable for Jews are derived from rules in the books of Leviticus and Deuteronomy. Animals must be slaughtered and prepared in the prescribed way, in which the blood is drained from the body, while certain creatures, notably pigs and shellfish, are forbidden altogether. Meat and milk must not be cooked or consumed together, and separate utensils must be kept for each. Strict observance of these rules is today confined mainly to Orthodox Jews. For Passover, the additional culture key is to also avoid serving leavened bread. For menu suggestions, consider fish and vegetarian options such as sea bass and salmon, organic vegetables like arugula and pear, and matzo bread with fresh figs or chutney. Planning and invitations: Careful thought and planning creates a lovely event and avoids chaos. By giving careful consideration to the location, as well as the invitation and guest list, the perfect ambiance and mix of personalities can be created. It is difficult to exclude spouses from holiday gatherings, so plan for each guest to bring a significant other. If you consider hosting an outdoor event, have a "Plan B" lined up so that spring showers do not derail your best laid plans. Children: The invitation must clearly indicate whether children are invited. Holidays such as Easter and Passover naturally include the children of family and friends. If the kids are not invited, host an evening event rather than a brunch so your guests have time to hire a babysitter. When you receive an email from a parent requesting a favor because he can't find a sitter, respond that you understand and will miss him; it is inappropriate for you to allow his daughter to attend, without making an exception for all of the other children. You must be fair and be consistent. Setting a beautiful and proper table: A place setting is a global compass for your dining experience. It is important to understand how to navigate the system, whether simple or multiple courses, and understand the proper placement of the plates, stemware and utensils. In our home, we set the table the day before the dinner. With the exception of the cocktail and dessert forks, most forks are set on the left side of the plate. The cocktail fork may be placed on the right side in a soup spoon, or brought out with the cocktail. The dessert fork is placed above the plate. The bread plate and butter spreader are placed on the left of the dinner plate. The stemware is placed on the right of the dinner plate. Place the napkin in a creative way, for examples see Napkin Wizard. Prearranging seating with place cards: Pay special attention to the chemistry between your guests and prearrange seating by using artful place cards. You and your children can even create your own place cards as a fun craft activity. It is nice to split couples so they can converse with others. If you know your guests well, you'll know who will blend well with whom, especially when seating singles and newcomers. The beauty of place cards is that guests are relieved to discover where they are placed, and don't need to worry about finding a perch. Place each card at the top of the place setting (or dessert fork or spoon). Research both holidays: Before you RSVP, research and have a basic awareness of each holiday. However, it is rare to find anyone these days who fully understands every holiday, so don't worry about all of the history. RSVP and arrive promptly: Yes, we still RSVP and arrive promptly in 2016, unless it is an open house event. Hosts rely on guests to reply to the invitation promptly for planning, menu preparation, seating and party gifts. Arriving within 5-10 minutes of starting time is appropriate, any later and a call to the hostess is expected to determine if you are interrupting dinner, and should join the guests for coffee and dessert instead. Be informed and conversational: We all understand if you have been up to your eye balls in alligators with parental responsibilities, or business, and haven't kept up with the latest news. Catch-up by reading the Huffington Post and other news sources. During a social meal, you are expected to contribute to the conversation with interesting questions like, "What book are you reading?" "Do you have summer travel plans?" "Which movie will you watch next?" Dress appropriately: take the time to clean up if you are going to show up. The host and hostess are going to quite a bit of effort to entertain. Even if the brunch is casual, spruce up a bit and leave the work-out clothes at home. You don't want to look scruffy in the group photo! Hostess gifts and a handwritten thank you note: A thoughtful guest arrives with a small hostess gift such as tea towels, scented candles or a diffuser. If gifting flowers, have them delivered in advance. Sending a personally handwritten thank you note within 48 hours is a beautiful expression of gratitude.